Boeing hosted the 2018 Family Day for Boeing employees and contractors to bring their family and friends out for an afternoon of fun, food, and STEM education. 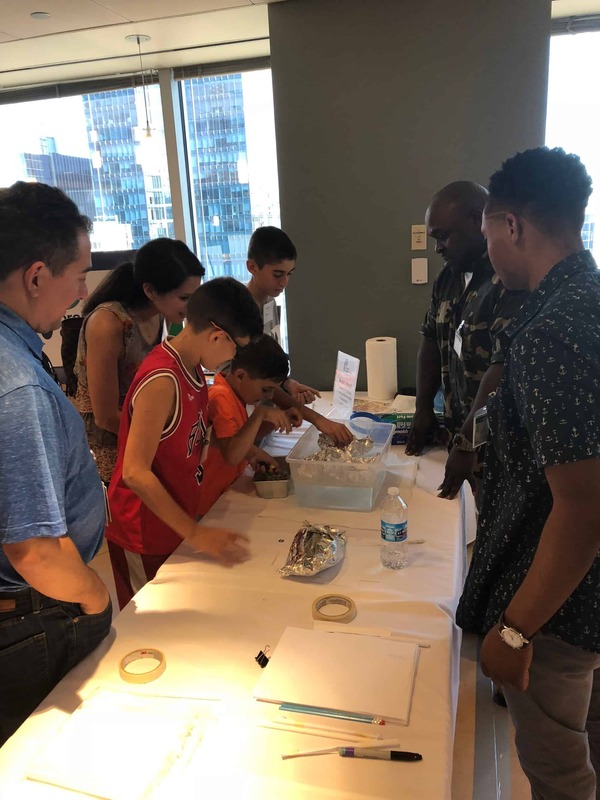 Guests were able to participate in activities led by some of Chicago’s premier museums and STEM organizations, including the Museum of Science and Industry, Adler Planetarium, Project Exploration, Project Syncere, Northwestern University FUSE, and Aerostar. Activities included building paper rockets and mini catapults, participating in a coding challenge, building a balloon-powered car, operating an actual flight simulator, using a 3-D printer and demonstrations by 2 FIRST Robotics Team mentored by a local Boeing employee. The challenge allows students to build a hands-on–systems that allow for control and flight of aircraft. The activity is founded on leveraging the curiosity inspired by Boeing innovative products and the tools developed by Northwestern University. Students are actively building, wiring, test, and experimenting on the design process to build a controller connected to a laptop simulator in action with them as the lead engineer and builder – beyond the typical worksheets – to build a product based on these principles of innovation, just as Boeing engineers do every day. This challenge will be available for use across the entire Boeing enterprise as employees engage with students and families as well as 22,000 FUSE users globally. It’s a celebration for our 2018 The Outstanding Building of the Year (TOBY) Award-winning building, our community partnerships and our commitment to building the future of aerospace. A big thank you to all the STEM Co-op member organizations who participated in making Boeing Family Day a huge success!